Gastropub near Victoria Station, part of the Food & Fuel group. 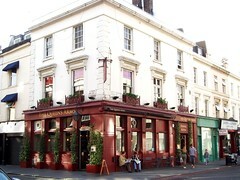 It went through a few name changes in the mid-2000s (The Page, a Slug & Lettuce) before returning to its original name. It comprises a single room with the bar running along one side of the room. The place is bright and airy, with sturdy distressed wooden tables, nicely understated. A flatscreen is mounted somewhat incongruously to the side of the bar. The undersides of the tables are however on the verge of being too close to the chairs for one to fit one's legs under. There is a dining room upstairs, but the ground floor functions primarily as a pub. There are five handpumps for ale; on Kake's March 2012 visit, four of these were on, offering Old Rosie cider, Sharp's Special, and two London-brewed ales, Sambrook's Wandle and By The Horns Diamond Geezer. The keg options included Aspalls Cyder, Bitburger, and Meantime London Lager. There was also a display of pump clips on the wall next to the bar, but it wasn't clear whether these were "coming soon" or "just been". On Ewan and Jo's June 2008 visit there was also a very decent wine list, with small glasses ranging from £3.50-£5.15; both Ewan's chenin blanc and Jo's rose were excellently drinkable choices. When Kake visited on a Wednesday early evening in March 2012, there were a fair few people sitting outside at 5pm but plenty of seats inside. Music was playing fairly quietly and the flatscreen was switched off. On Ewan's Sunday visit in June 2008 there was a good selection of newspapers available for reading, but on Kake's visit the newspaper holders were empty, so perhaps they only get the papers at weekends. Food is on offer, both lunch and dinner. Prices are on the steep side for pub food (mains range from £10 to £18.50, as of March 2012), but offer interesting options. Accessibility: A small step to get in. Didn't check the toilets. Last visited by Kake, March 2012. Opening hours taken from the Queens Arms website, March 2012. Last edited 2013-05-10 07:51:49 (version 7; diff). List all versions. Page last edited 2013-05-10 07:51:49 (version 7).